The museum held one workday in January - on Saturday the 19th. Turn-out among the volunteers was excellent, as was the weather! Lots of progress was made on various projects! Here is a run-down on all the action! Dave Miller and Steve Richardson continued working on T-1's rub strips and cheek cowl frames. Steve Richardson specialized in the fuselage longeron rub strips, making good progress in getting the wood strips aligned properly and tacked on. Dave Miller worked on fabricating the starboard cheek cowl mounting frame. Fabricating these mounting frames is intricate work, in the same way that the longeron rub strips were - numerous relief cuts needed to clear brackets and bolt heads, many of which were on angles. No work was done on T-2. The fuselage was in the process of being stripped so it could be flipped over on the work stands to permit fabrication of the belly panels. 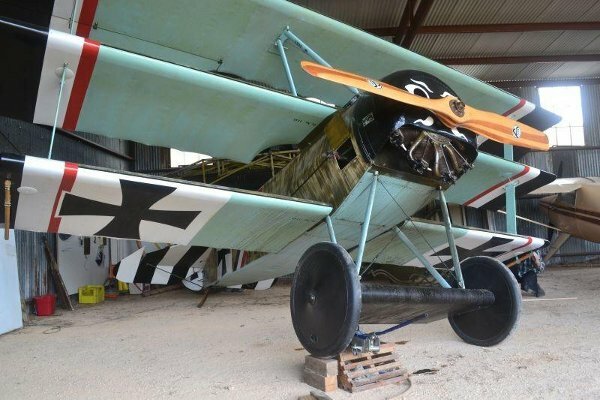 Mike and Don Craig set about working on the Triplane's spark plugs as well as replacing the wing tip skids with examples that curved downwards more to try to keep the wing tips from contacting the ground. The wing tip skids on the machine were fabricated from straight sledge hammer handles and in some of the landing excitement the trailing edge of the wing tip can contact the ground and cause damage. Mike showed up with two curved ax handles as potential replacements. Mike and Don spent some time evaluating whether the ax handles would actually do a better job of protecting the wing tips, as the ax handles were noticeably shorter than the sledge hammer handles. Their definitive visual aid was to use a floor jack and blocks to tilt the airplane up almost into wingtip skid touchdown position, first with the current skid installed, then with the replacement skid installed. Their opinion was that the ax handle replacement would elevate the wing tip a couple of inches, so they removed the ax handles to finish shaping the handles and lacquer them. Mike and Don have two items on their ignition system overhaul - replace the spark plugs and install new points and points cam in the magneto. They have located the points cam and have ordered a couple but they did not arrive in time for the workday. 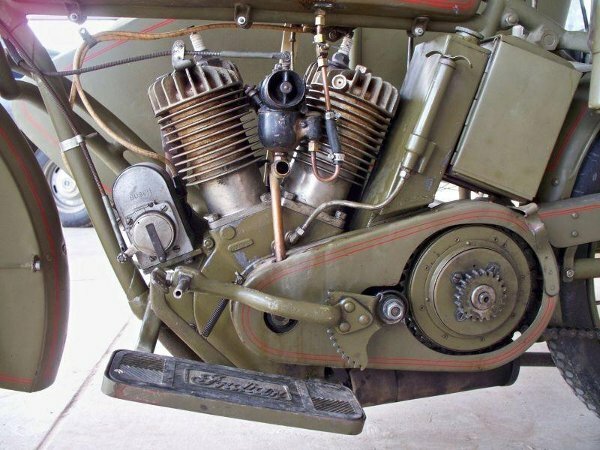 Mike researched the spark plugs and determined that spark plugs used for vintage motorcycles with magneto ignition would work in the Triplane's rotary engine. $2 each!! They fit well, and better yet Mike reports the engine ran better than he's ever felt it. The engine started on the first flip and ran significantly smoother! During the engine ground test Don noticed that the machine gun muzzles were no longer shimmying around, they stayed still. Future work on the airplane includes installing the new wing tip skids and new magneto points cam, as well as the points themselves if replacement units can be found. Mike plans on making a few adjustments to the tail skid to give it a bit more authority, and install new main gear tires as the current tires are suffering from dry rot. A new volunteer, James Olsen, is an A&P and he jumped onto the Piper Cub's engine to change the oil and look into the tail wheel unit, which has apparently become bent. Looking at the airplane from the rear the tail wheel is slightly cocked over towards the left and misaligned with the fuselage but the entire problem appears to be located in the tail wheel's leaf spring. The leaves are no longer aligned with each other and the lower leaf also looked twisted. Charlotte has been complaining that the airplane won't turn left while taxiing, so after the engine was run after servicing Ian took the airplane up to test it out. Ian checked the tail wheel movement prior to take-off and everything seemed fine, but after landing the tail wheel wouldn't turn left. Ian also reports that the trim system isn't working and he made no progress on diagnosing the problem. In the air he can give it a bit nose up trim and then the system stops responding. No further repair was attempted. Dave Edgerly, Jerry Stark, and Kevin Monahan continued their work in getting the OX-5 to run. Jerry brought along a Harbor Freight bore scope to look up inside the combustion chambers. They were able to verify that cylinder #1 does indeed have a leak at the exhaust valve seat. Next workday will see them lapping in the valve and seat. The cylinder was prepped for the valve work by removing the valve actuation parts. The other issue was a cylinder where the valve lash could not be set correctly as the pushrod appeared to be too short! A replacement pushrod was located in one of the parts drawers and cleaned up for installation. Once everything was back together they had no difficulty achieving the correct 0.10" valve lash. Steve reports this aircraft is almost ready to fly! He is waiting on paperwork for the pusher prop. The documentation is expected any time now. 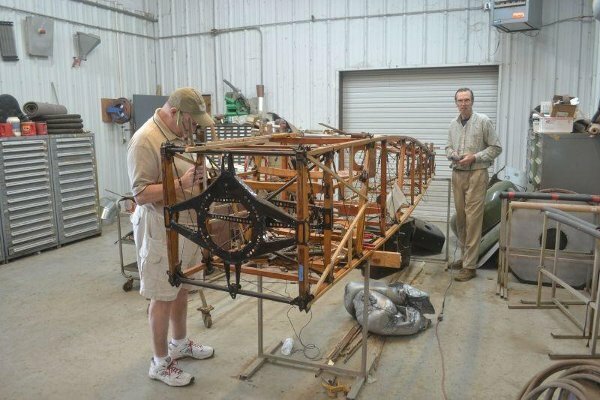 Steve has made good progress on getting the airplane ready to fly again, though it is proving to be a bit more expensive than originally thought! Typical airplane! The aileron hinges have been replaced as required. Steve has also inspected the wing's center section for corrosion, also as required. Of the three approved methods of inspection Steve says removing the wings to directly look inside and inspect the metal was by far the easiest! Both wings were removed in 20 minutes total! The new instrument panel has been fabricated and is approaching readiness for installation. There was some consideration of applying for the STC that allows higher weight limits, however when Steve realized that required aircraft modifications included re-skinning the forward fuselage the STC idea was shelved! Kevin reports that not much has happened with the Indian. He continues chasing the parts needed to finish the repairs from unreliable vendors dispersed around the globe. Pretty frustrating. Kevin did give a tour of the museum (together with Billy Cheshire) to a trio from "Ride Texas" a motorcycling organization, so Kevin brought the Indian back to show them that bike as well as the Triumph and all the aircraft and Model Ts. They were impressed that both bike could start and run! In the process of installing / removing the fuel tanks from the Indian one of the frame-mounted tabs broke off and Kevin has repaired that. Work on refinishing the fuel tanks continues. Virtually all the Model T vehicles were pulled from the hangar and started if possible. All had their radiator contents adjusted with antifreeze and the resulting mix tested for temperature tolerance. The main folks doing this work were Steve Penaluna and his son, Cameron Whitaker, Ian Whitaker, and Lynn Howell. The wrecker will need new transmission bands and those have been ordered. The Kevlar bands will be installed in the Blue Racer as the bands already installed have issues! Terry Bledsoe spent much of his day driving the front end loader, going back and forth from the dirt berm carrying dirt out to a part of the airfield where the hogs have rooted through the turf and dug everything up. Carl Canga, with an assist from Dave Miller worked on the new road sign, located inside the entrance where the road splits in two. They cut and shaped some lumber to form part of the sign and Carl got a good look at his laser cut letters. The current sign is absolutely rotting apart! Tom Moore and Doug Ratchford worked on installing caster wheels on the existing stands under the display engines. They managed to get the Hall-Scott done; apparently the wood in the stand is very old dense pine and was difficult to work with. Diane Edgerly came out with Dave and worked on cataloging the donated library in the PFM HQ building. She was shocked by the number of boxes in the room and elected to start with the prints. She reports that there are many items that would look very good gracing someone's walls. There are some prints by artists that Dave Orloff says are very popular, such as Hubbell and Biederman. Diane is hoping to be a regular and begin working her way through the entire mountain of books. If anyone has any shelving to donate Diane says it would make the task a little easier to manage. Charlotte, Jack and Ian hung up a replacement windsock for the field as the old one was a tattered rag! Charlotte was the one who rode the forklift up to replace the windsock. We should be good for another year or two!